Vinca major ,L. var. variegata Loud. Vinca major is introduced to new locations usually as an ornamental or medicinal herb. It spreads locally from dumped garden waste, plant fragments carried downstream and as a garden escape along shady corridors. It grows most vigorously in moist shady areas in forests, along streams and urban areas. Once established the herb competes with native vegetation by smothering all native groundcover vegetation and preventing the regeneration of trees and shrubs. 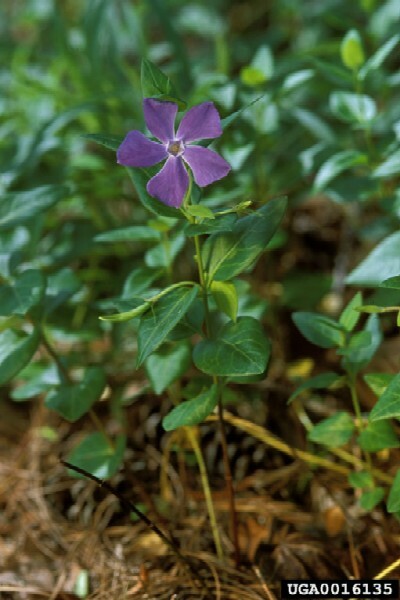 Vinca major is a serious threat to the understorey of forested areas and streamside vegetation. Vinca major is a perennial, evergreen herb with erect flowering stems (0.25-0.5m long) and trailing non-flowering stems (1m long) that roots at the node. The stems contain a milky latex and shiny, dark green leaves that are 2-3cm long, opposite, round ovate, and pinnately (having parts arranged on each side of a common axis) veined. The leaves have hairs 0.1-0.4mm long along the edges and the midribs on the upper surface. The flowers are blue to violet, 2-5cm diameter and made up of five equally sized petals (Bean and Russo, 2003). Flowering occurs in the spring and summer in Australia (CCSER, UNDATED). ESC (UNDATED) states that, “moist shady situations will produce thickest growth”. It commonly occurs along riverbanks, on silty alluvial soils, but may also appear around the edges of towns, in cemeteries and anywhere where garden refuse is dumped. Bailey (1914, in Bean and Russo, 2003) describes V. major as being able to, “grow in the deepest shade, even in poor soil”. However, “V. major grows most vigorously in moist soil with only partial sun”. According to Stearn (1973, in Bean and Russo, 2003) and Muenscher (1955, in Bean and Russo, 2003) hot, dry, or cold weather can cause the herb to die back temporarily. V. major is most commonly found around lawns, roadsides, cemeteries, and shaded waste places in moist rich soil where it has escaped. According to Bean and Russo, it often spreads from old home sites and due to it’s shade requirement, often grows in patches around the bases of trees and around drainages where dense cover is available. According to CCSER (UNDATED), V. major, “does better in moist areas, especially on ephemeral or permanent creeklines and river channels”. According to Bailey (1914, in Bean and Russo 2003), “the best means of propagating is by division or by cuttings, as the seeds rarely mature”. V. major is introduced to new locations as a medicinal herb (Bean and Russo 2003).V. major is commonly sold as an ornamental (Bean and Russo, 2003)V. major is planted as an ornamental ground cover (Bean Russo, 2003). 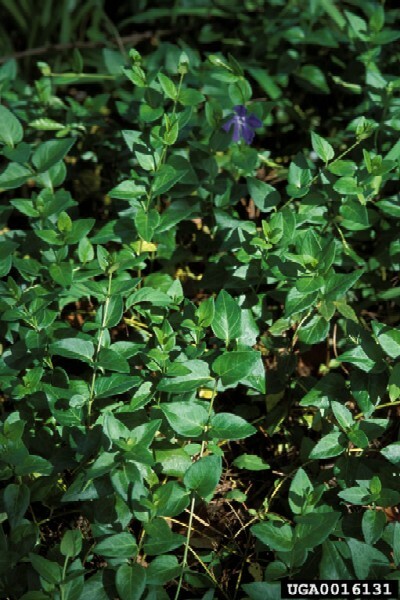 Recommended citation: Global Invasive Species Database (2019) Species profile: Vinca major. Downloaded from http://www.iucngisd.org/gisd/species.php?sc=487 on 22-04-2019. 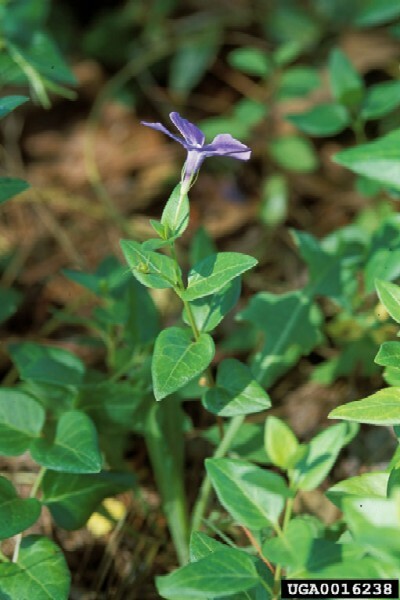 According to Bailey (1914, in Bean and Russo, 2003) and McClintock (1985, in Bean and Russo, 2003), Vinca major forms dense stands that exclude other herbs and creates a problem in areas where it competes with native herbs. According to CCSER (UNDATED), “this species is a particular threat to the understory of riverine vegetation as it will spread from plant fragments carried by high flows”. According to ESC (UNDATED), V. major, “forms dense mats which smother all native groundcover vegetation and prevent regeneration of trees and shrubs. This can have important long term consequences on streambanks, where the eventual loss of native tree and shrub cover could lead to erosion”. Physical: Muenscher (1955, in Bean and Russo, 2003) recommends manual removal by raising the runners with a rake, mowing them down close to the ground, or digging them out by hand. \r\nChemical: According to CCSER (undated), “removal of stolons [the trailing branch that produces new plants from buds; a runner] by hand and spot spraying active growth with 0.25% triclopyr in water or 1% glyphosate in water” are effective control measures currently used. According to Bean and Russo (2003), the most effective chemical controls are paraquat and Goal, which contain the active ingredient oxyflurfen. Other chemicals that have been proven effective are 2,4-D, 2,3,6-TBA, and Fenuron. Informations on Vinca major has been recorded for the following locations. Click on the name for additional informations. Bean, C. and Russo, M. J., 2003. Vinca major. Invasives On The Web [Online Database]. The Nature Conservancy. 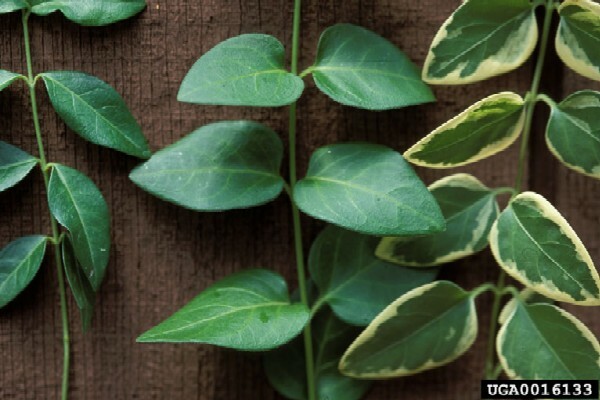 Summary: Detailed information on Vinca major, which is very closely related to Vinca minor. The information used includes ecological impacts of the invasive and control measures used against it. Available from: http://tncweeds.ucdavis.edu/esadocs/documnts/vincmaj.pdf [Accessed 20 October 2003]. CCSER (Conservation Council of the South East Region) UNDATED. Vinca major. Weeds [Online Database] ACT (Australian Capital Territory) Goverment. Summary: This site has a brief summary of the native range, dispersal, description, distribution, impacts on Australia, and control methods used. Available from:http://www.ecoaction.net.au/ccserac/docs/weeds/vinca.htm [Accessed 22 October 2003]. Eurobodalla Shire Council (ESC), undated. Vinca major. South Coast Weeds [Online Database] Eurobodalla Shire Council. Summary: Includes information on description, habitat, impacts, dispersal, look-alikes, and control measures. Available from: http://www.esc.nsw.gov.au/Weeds/Sheets/herbs/H%20Periwinkle.htm [Accessed 22 October 2003]. Twyford and Baxter, 1999. Chemical control of blue periwinkle (Vinca major L.) in Croajingolong National Park, Victoria. Plant Protection Quarterly. 14(2).47-50. Wotherspoon and Wotherspoon., 2002. The evolution and execution of a plan for invasive weed eradication and control, Rangitoto Island, Hauraki Gulf, New Zealand. In Turning the tide: the eradication of invasive species: 381-388. Veitch, C.R. and Clout, M.N.(eds). IUCN SSC Invasive Species Specialist Group. IUCN. Gland. Switzerland and Cambridge. UK. Hadjikyriakou and Hadjisterkotis, 2002.The adventive plants of Cyprus with new records of invasive species. Zeitschrift Fuer Jagdwissenschaft (0044-2887); Volume: 48. Natural Resource Conservation Service (NRCS) Undated. Vinca minor. Plants Database [Online Database]. USDA. Summary: The full scientific name, common names, taxonomy, distribution, and synonyms are listed on this page.